Situated at Sunshine Beach on a long thin site, this large residence is located between a medium density unit conurbation on one side and the ocean on the other. This visually unobtrusive residence is both inconspicuous & discrete from the road & acts as a medium between ocean & lake (swimming pool). Borrowing tectonics from nature, this building was designed with inspiration from the neighboring headland, the dramatic crevice voids between rock-wall faces, and the lightness of driftwood washed up on the shoreline. There are caves for shelter, which feel as though they have been hewn from solid rock, giving protection from the harsh ocean front elements. In contrast, there are lightweight translucent structures that nestle between the heaviness like lanterns. 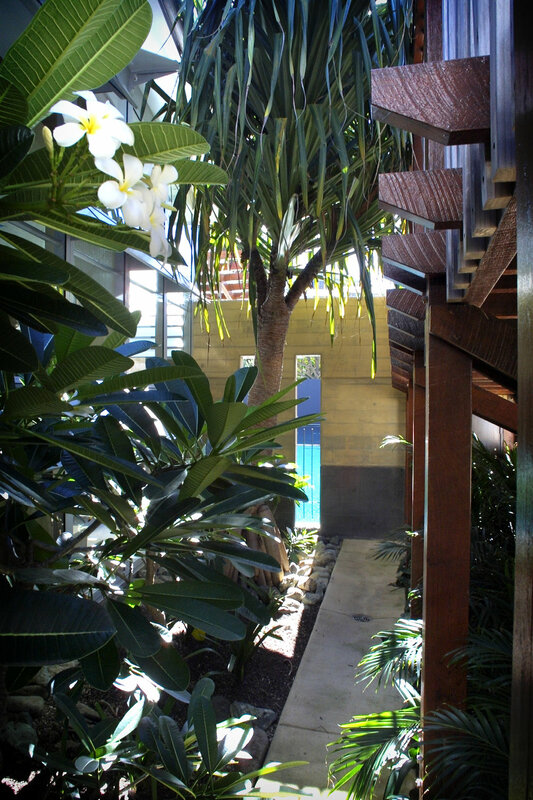 The architectural philosophy incorporates Pacific Rim Asian concepts (heaviness/lightness, darkness/luminosity, mass/void, rigid strength/flexibility, inverted spatial configuration) infused with aspects of the contemporary Queensland verandah and pavilion house.Within the spatial configuration and off-form concrete collage, is subtle overlaying of the Australian vernacular beach shack. The atrium space within the ‘U’ shaped plan creates a vertical crevice, forming a space which links street/pool courtyard with the ocean and the beach. The crevice introduces natural light, winter sun, perfume from frangapanni trees, and northern aspect for all ancillary rooms.A long pedestrian ramp connects the street entry to an elevated courtyard/”out-door room” providing living spaces on the uppermost level with improved aspect to view vistas. The ‘light-weight’, or lantern segments of the house consist of timber, oversized weather-boards, mesh and translucent sheeting. These areas, infused with natural light, incorporate the ‘driftwood’ metaphor. Inclined structural timber columns, supporting the upper-southern cantilever, seen from the lower level, evoke the experience of being under a timber jetty. The resulting caves, crevices and lanterns produce a special flow, both longitudinally and vertically, offering occupants a variety of experiences as they move through the building. Stone floors have the feeling of wet sand under bare feet, surprise vistas & view windows increase the space/time experience of moving through the building. A sensitive, relative palette of materials provides textural, ideological and visual connectivity to the larger site. This is the second house designed for this client by JMA. The previous house, also on a long thin site, overlooks the river. The Dragon House is an evolution (within the office) of the ‘long thin house’, or ‘verandah house’. The philosophy of connecting water-bodies and creating ‘force’ lines (of light & energy) through the site/building, has also been further developed and refined in the Dragon House. The ideology of creating spaces that conduct, channel and infuse light and energy is drawn from traditional Asian/Pacific Rim vernacular. This contrasts to the approach of focusing on building form to divide space. Hence the ‘Dragon” (spirit) embodying the light/energy forces can move through the building freely. 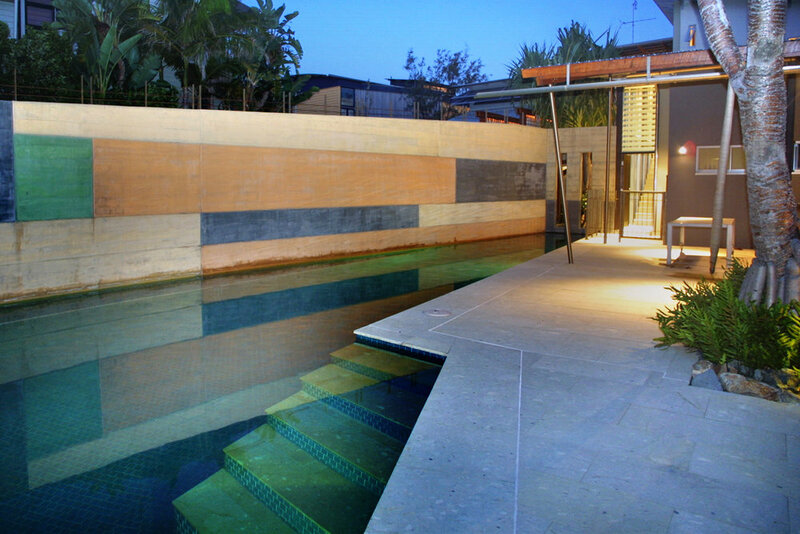 There are clear lines of visual connection through the house, connecting water bodies and physical features. The clients have three “fast-growing” boys who require a degree of separation and privacy from the rest of the house. Hence the ‘U’ shaped plan evolved, with the lower southern wing as the boy’s living space and bedrooms. The upper level (of long thin tail) contains a rec-room and housekeepers quarters. The whole of this southern wing consists of thin spaces punctuated with northern light. The living room sits above the master-bedroom, with the ‘den’ at basement level, in a ‘stone tower’ exposed ocean aspect. The guest bedroom is in a separate pavilion-tower on the northern side with clerestory lighting. As opposed to the thin previous “light-weight” house, the Scottish clients wanted to work with heavier materials & imagery. Noosa is currently being inundated with ‘Tuscan’ & ‘Mexican’ stereo-types which have no real connection to the location. We developed the ‘Head-land’ and ‘Shore-line’ metaphors as an innate response to a unique environment colours were derived from the geotechnics of the surrounding landscape. Pigmented concrete walls create subtle colour & textural patterning, reflecting the spirit the old beach house in a new medium. Parts of the walling were formed with boards, giving ‘weather-board’ patterning imprint.